"Food was my playground," recalls Theo Friedman, A15, of growing up in the Berkshires in Western Massachusetts. Picking blueberries with his mother and mushroom hunting with his father, and family dinners where both parents cooked, were the foundation for the role food plays in his life. "Family dinners were a given every night—no exception," says Friedman. "and it established food, cooking, eating, and the dining table as a space for relationships to grow. It brought us together." He had his "eureka moment"—making cream puffs for his father's birthday—when he was thirteen. "The smile on my dad's face after his first bite was probably my most important cooking experience and lesson. It was a simple and pure form of communication. Those cream puffs, that piece of me, made him happy. His reaction and the connection it created have been my inspiration." Throughout high school Friedman was passionate about art—photography in particular—and he planned to major in environmental studies at Tufts. The summer before college he worked at a restaurant, but even then, "the switch didn't turn on." During his freshman year, Friedman began watching videos demonstrating modernist cooking on YouTube. The techniques captivated him, in particular a demonstration of how agar-agar, a gel extracted from algae, can be used to make strawberry noodles. Soon he came to view cooking as another form of artistic expression. Modernist chef and restaurateur Grant Achatz also "ignited the fire," says Friedman. Friedman read the chef's memoir, Life on the Line: A Chef's Story of Chasing Greatness, Facing Death, and Redefining the Way We Eat, three times. Today, social media is a constant source of inspiration and creativity. "I can see the works of hundreds of chefs from around the globe without traveling." Friedman cooked over his four years at Tufts, hosting taco nights for hundreds of students as well as smaller pop-up (one time) tasting dinners in his apartment. "These spaces have allowed me to share what I love with the Tufts community," says Friedman. The structure of a pop-up meal offers him unique opportunities. "In a restaurant setting, the food is telling a story with an anonymous author," says Friedman. "At a pop-up event, I see the faces of my guests, and hear their experiences." Sharing his culinary vision led Friedman and biology major Ezra Schwartz, A16, to give a joint lecture on campus, "Cooking, Science and Creativity," hosted by the Tufts Culinary Society—a student organization that educates the Tufts community about culinary arts and food appreciation—and the American Chemistry Society. The lecture was so well received it led to a Tufts Experimental College course, The Chemistry of Cooking: Science in the Kitchen, in which the duo explored cooking through a scientific lens. "Theo was so knowledgeable and was able share what it is like to work in a restaurant," says Maya DeBellis, A15, who took the course. "I was surprised by how accessible these techniques were. I thought that these crazy gels and foams were something that only Michelin starred chefs were able to do with ease, but most of these techniques can be done easily at home without expensive machines and gadgets." During summers, Friedman honed his skills, prepping ingredients and line cooking at New York's Gotham Bar and Grill and WD-50. 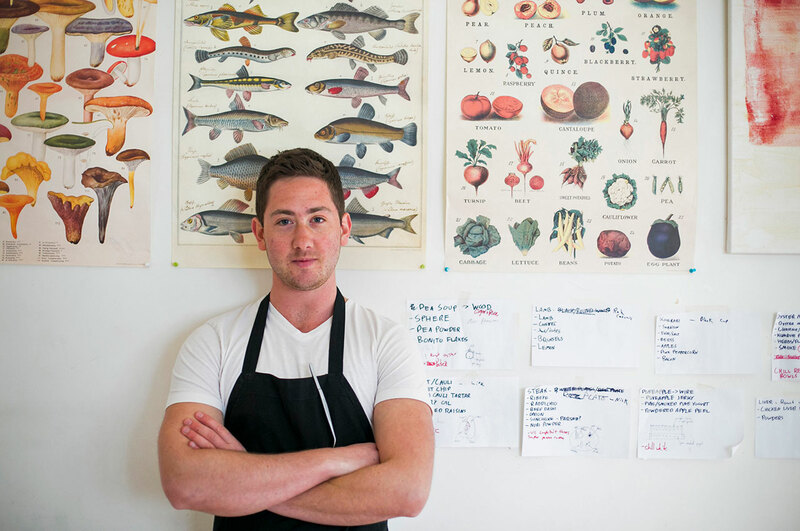 Last summer, he returned to the Berkshires and worked with chef Bjorn Somlo at Nudel, an acclaimed restaurant in Lenox, Massachusetts, which features a seasonally inspired menu. While Friedman was clearly interested in modern cooking techniques, says Somlo, he was eager to work in a farm-to-table restaurant. "Coming to a restaurant where we work only with what is locally available is very different than working in New York, but Friedman was completely on board," adds Somlo. "He has humility and an eagerness to put in a good day's work, combined with thoughtfulness and compassion, and that's rare." For Friedman, Nudel's open kitchen and counter where diners can watch their dinner being prepared provided a chance to see patrons who are engaged and interacting with their food preparers. "Due to space constraints in many New York restaurants, food is prepped in a basement kitchen, and customers never see who is cooking," says Friedman. "If the receiving end is invisible, I don't get as much satisfaction and fulfillment." An American Studies major and Entrepreneurial Leadership studies minor, Friedman feels fortunate to have found an area of study "which gave me space to do what I wanted." He met his advisor, Assistant Professor of Anthropology Professor Alex Blanchette, at the beginning of his junior year. "Theo was struggling to find ways to converge his interest in cooking with his academic studies," says Blanchette. "My own work, in part, revolves around life and labor in settings of intensive industrial agriculture." Blanchette and Friedman started thinking about ways in which he might conceive a capstone project around the notion that food and cooking are a form of communication between cook and consumer, says Blanchette. The project, he adds, was "based on the premise that industrial agriculture creates distance between producers and consumers, between people and nature, and between our economic lives and our values." Friedman added the concept of meal preparation as artistic performance to his project—he wanted to create a meal that would be an exhibition, and write a paper in the form of an artist's statement. Assistant Professor of Drama and Dance Noe Montez became an advisor on the project. "Theo's goal was to create a twenty-course meal that would explore the ways that we are oftentimes separated from the process of cooking and consuming food by an industrial food system that too often makes eating a mechanical act, rather than an act imbued with the spirit and soul of humanism," says Montez. "I wanted to insert bits and pieces of myself into the meal as much as possible, to say something about my own life, though the food," says Friedman. "Cooking gives me the chance to create and express specific emotions and stories that I feel utterly compelled to share and give in the only way that I know how." To prepare for the final performance, Friedman devoted himself to developing, testing, and reworking each course on the menu over the winter, including a trial-run dinner in February. He recruited students to help, many of whom have worked in restaurants, and the Tufts Undergraduate Research Fund provided a grant to cover some of his expenses. Friedman strives to elicit reactions from his diners through the element of surprise. "I want guests to feel uncomfortable, awkward, or unsure about themselves, so there is the unexpected: chicken coated in chocolate and vegetables in dessert courses," says Friedman. "I serve food hanging from a string that the diner must rip off to eat. By challenging the very notion of what a ‘dinner' is, the diner is suddenly engaged and thinking, interacting and connecting." Friedman and his classmates prepared the test dinner for eleven guests in his small apartment. Rae Steinbach, A15, wrote about the dinner for Spoon University, an online college food publication. "I was amazed at the dishes and flavors that emerged from a kitchen like the one in my off-campus house," recalls Steinbach. "The intricate and innovative courses were unlike any I had eaten or even seen before." The final twenty course menu was prepared and served by Friedman and his team to Professors Blanchette and Montez, as well as Boston area chefs and members of the food community, in Friedman's same small apartment. A Boston Globe reporter writing a feature article on Friedman and the dinner also attended. Many courses were served on wood from Friedman's back yard in the Berkshires. "It has a part of me in it," says Friedman, "it is part of my story." For a course labeled "Beet, Cauliflower, Curry, Raisin"—beet "meringue" beet juice topped with curried cauliflower tartare and pickled golden raisin—Friedman placed each serving on a different level of a sculpture. "It's more limiting to serve on individual plates," says Friedman. "The more you can engage diners in the experience and have them question the moment, and look to their neighbors for an answer, the more you build a sense of community." Retno Pratiwi, a chef specializing in Indonesian cuisine who attended the dinner, recalls the excitement of anticipating each dish. "The meticulously plated dishes flowed well," says Pratiwi, "like something you'd see from a high-end chef. The difference is Theo is only in his early twenties." Her favorite dish was raw scallop thinly sliced and served with pomegranate juice and hazelnut. "Memorable," says Pratiwi, "because the texture and the taste reminded me of fresh young coconut flesh. It was a surprise to taste a shellfish as a fruit!" Another course, "Grapefruit, Fennel, Olive Oil"—raw grapefruit, grapefruit curd, candied grapefruit rind, fennel powder, with grapefruit/Campari/Thai basil granita, powdered olive oil and a grapefruit meringue —was inspired by the memories of eating grapefruit with his father for breakfast. "Monkfish, Red Pepper, Black Olive" was similar to a dish Friedman cooked at WD-50. "It was a meal of high caliber that I'd have been happy to eat nearly anywhere in Boston, prepared in a college student's Somerville kitchen," says Montez." "Theo tried a variety of different strategies and techniques—stories, ingredients, setting, playing with unfamiliar tastes and sensations—to unify the ten of us through a ‘connected' experience," says Blanchette. "It was an attempt to push the degree to which cooking can constitute an alternative to the present food system." For Friedman, the dinners that have been part of his capstone project have been powerful experiences. "In Marx's words, 'I finally can see the meaning in my work.' I see how what I do affects people; how it makes them happy, how it draws them together, how it makes a memory for them. In the end, I can look back and feel this is the thing that I'm most proud of." This summer, Friedman plans to organize pop-up dinners in the Boston area and is making plans to travel to Barcelona, Spain, where he spent his junior year. "It felt like home," says Friedman. "France has the classic roots, but some of the best food and cooks are coming out of Spain. I'm planning the classic journey to learn from the masters. Friedman is "hungry" to match his technical skills with his ideas. "I have so many ideas popping into my head. Every person I meet, every shape I see, and every smell is stored in my brain. Chefs collect an amazing catalog of inspiration," he says. "Now that I've graduated, I can't wait to soak it up and do what I've been dreaming of."